Cate: Please welcome Laura Vosika. Laura, will you please share a short bio with us? Laura: I grew up in the military, earned a degree in music, and played freelance trombone into my 30's. I taught general music, directed a school band, and have taught music lessons for over 20 years on piano, harp, winds, and brass. I have 9 wonderful children--7 boys and 2 girls. Cate: Wow, you are one busy woman! Tell us about Blue Bells of Scotland and where it's available. Laura: Blue Bells of Scotland is the story of two men, complete opposites but for their looks and love of music, who switch places in time and end up caught in one another's lives. Shawn Kleiner is a modern American musical celebrity, a womanizer who wears the accusation of self-centeredness like a badge of honor. Niall Campbell is a devout and responsible medieval Highland warrior with the fate of Scotland resting on his shoulders. When they spend the night in the same tower, they wake up in the wrong times, trapped in one another's lives. Signed copies are available at my site www.bluebellstrilogy.com or http://www.bluebellstrilogy.com/Order.php. Copies are sold at amazon or available in multiple electronic formats at smashwords. Laura: "Give me the car keys." Amy thrust her hand out. Shawn laughed. "You didn't get your international license. You can't drive." Shawn dug in the pocket of his baggy, medieval trews. "I know you, Amy. You won't jaywalk on a deserted street. I paid good money for this meal. I'll be out when I'm done." He flipped the keys at her, much harder than necessary. She caught them in a neat overhand. "I will expect my grandmother's ring back as promised," she said in clipped tones, "or I will raise a holy hell in every possible corner of your life, till you wish you'd never thought up that idiotic story about tinagle connectors." She threw the tartan down at him. "Stuff it, Shawn. I saw Jim while I was waiting in the lobby. He almost died laughing, said there's no such thing on a trombone. Thanks for humiliating me, on top of it. Maybe some day you'll come clean about what you needed—make that wanted—the money for." "Hey, that's not fair!" He jumped to his feet. "I needed that money! There was this big Scot. He was coming with his friends to beat the living daylights out of me!" "Did you sleep with his wife? You probably deserved to be beaten to a pulp." She shoved past him, glaring back from the arched doorway at the top of the stairwell. "I cannot believe I've stayed with you this long!" She spun on her heel. Her voice floated back up from the dark staircase. "I cannot believe I kept thinking there was something better in you!" He ran to the western wall to see her emerge from the tower into the courtyard. Mist swirled around her ankles. "Everybody told me there was nothing better there!" she shouted up at him. "Bull!" he shouted back, leaning over the tower. "They love me!" "You have no idea what they say behind your back," Amy yelled. "Selfish, self-centered, obnoxious, loud! They're just afraid of your temper. Arrogant!" She turned and stormed across the courtyard, tearing through tendrils of mist grabbing at her legs. "I am not loud!" he bellowed. Laura: Well, the good news is, you get two heros to choose from. My writing group and readers have been divided on whether they prefer Niall or Shawn. Both are capable, confident leaders. If you like rogues, you'll prefer Shawn. If you like someone more refined, mannered, and moral, you'll prefer Niall. Laura: I have tried to keep my world as realistic as possible, through research and traveling to the sites in my book. 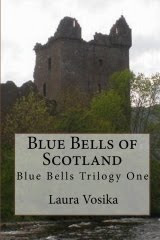 Laura: I'm working on the sequels to Blue Bells of Scotland. I have half a dozen other novels in various stages of writing, and am working on two non-fiction books: one on raising a large family and one on the actual events that form the backdrop of The Blue Bells Trilogy. Laura: Several ideas. My favorite childhood story was In The Keep of Time by Margaret Anderson. Like Shawn and Niall, the children in the story go into a Scottish keep and come out in the wrong time. As a trombonist, I was familiar with Arthur Pryor's showcase arrangement of the folk song, Blue Bells of Scotland. Researching the lyrics brought me to Bannockburn as a backdrop for the story, and Shawn's fate was decided. The story was originally intended to be about him, but Niall, as characters often do, had his own ideas and no intention of being ignored. Laura: I start as soon as I get up in the morning. And it's often the last thing I do at night. In between, I write as much as I can, while doing the things that need doing. Cate: Very cool! Is there anything you'd like to ask our readers? Laura: What are some of your favorite time travel and Scottish themed books? What do you love best about historical fiction? 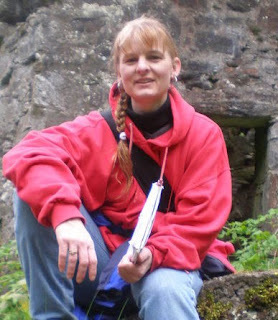 People are usually curious how a trombone-playing mother of 9 came to write about time travel and medieval Scottish battles. I’m often asked if I’m Scottish, or if I was inspired by Diana Gabaldon's Outlander series. I’d love to say I’m Scottish, but I’m not, and although I enjoy her books now, I hadn’t heard of Diana Gabaldon at all when I started writing Blue Bells. Rather, Blue Bells of Scotland, came from several parts of my own life, in addition to flashes of images that were just there. The first inspiration was a children's novel about four siblings who go into a ruined Scottish keep and come out into medieval Scotland. The cover image, of the mysterious ruin, and the story of being thrown into a different world, fascinated me. A second piece of the novel came to me in a full-blown image, of a musician so arrogant, selfish, and over-confident as to gamble away his instrument, his very livelihood, and then trick his girlfriend into getting it back for him. My background as a freelance musician was a third strong influence. With trombone as my primary instrument, and the advice to write what you know, my selfish, arrogant musician played trombone, too. But music influenced the book in bigger ways. Blue Bells of Scotland is a showpiece for trombonists. The images of the song—streaming banners and noble deeds—begged for a story. So now I had a mysterious castle, and a gambling, self-centered musician, somehow wrapped up with noble deeds and streaming banners. A vague story floated around in my head for a few years, but I never felt I had time to write it. In November 2005, I started writing and researching, nonetheless. I set out to find a battle which would involve streaming banners and noble deeds, and found Bannockburn. Thus Shawn, the arrogant musician, stepped out of his Scottish tower and into 1314. I spent three years researching everything I could find about Scotland, Robert the Bruce, and Bannockburn. In May of 2008, I traveled Scotland, visiting every location in my book: Bannockburn, the Monadhliath Mountains, Inverness, Stirling, and more. I took notes of every detail, the sounds, the weather, the smells. I traced tree leaves in my notebook, took over 1300 pictures, and came home to do more editing. Page by page, Blue Bells of Scotland grew into a trilogy. Like a good story, the twists and turns of life are endlessly fascinating. I never would have guessed that music would lead me to time travel and medieval battles. Cate: How wonderful you were able to travel to the setting. Thanks for being my guest, Laura! Wishing you much luck with Blue Bells of Scotland. Welcome Laura! Love your feisty heroine! She's wonderful. Thank you so much, Cate! Thanks for having me! It has been a pleasure! Still time to enter the RJ Summer Contest! Release day for Angels Sinners and Madmen! Cast a vote for Winning! Need an exotic getaway this summer? In the Spotlight Feature: me! Enter the RJ Summer Contest before August 31st! A blog stop, and a new review!